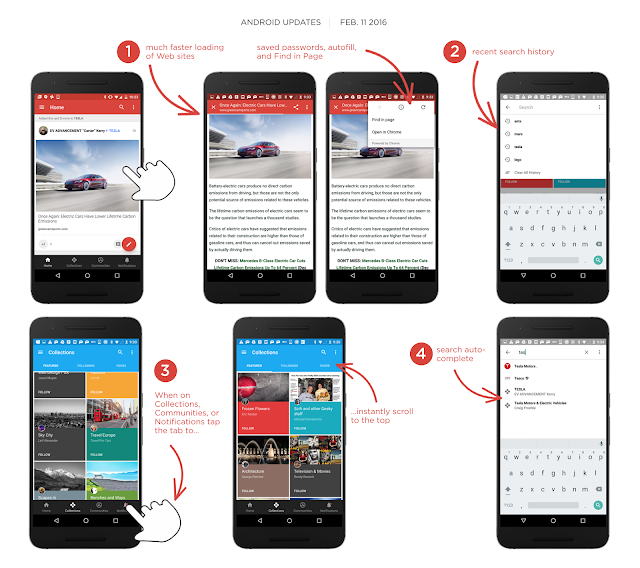 Google+ 7.2 for Android started rolling out last week with a more immersive browsing experience when tapping links in the stream, new search features and a medium-sized dose of squashed bugs. Right then, let’s get to it, shall we? A few weeks ago, Google started testing Chrome Custom Tabs in the Google+ Android app, but only switched it on server-side for a small number of lucky users. What this means is that when you tap on a link within an app with Chrome Custom Tabs enabled, instead of firing up the full-blown version of Chrome, instead you’ll see a stripped-down and customised interface, (hopefully) matching the colour scheme of the app in which it was opened. As you may have guessed, in Google+, the toolbar of the Chrome Custom Tab is red to match the brand, and it looks great. Another plus of this feature is that it is faster to load a webpage, slicker, and keeps the user experience consistent. Nice work, Google! Chrome Custom Tabs have now rolled out to everyone as part of the 7.2 release which you’ll be able to update from the Play Store so have a play and let us know what you think. Hate them? No problem. You can turn them off in the settings. There has been some major improvements to search in this release. Features such as autocomplete and history are now live, so next time you need to look something up, you’ll be able to get to what you want in a little less time. A couple of releases ago, a new feature was introduced which would let you jump straight to the top of the stream upon tapping the ‘Home’ button, located on the tab bar at the bottom. And in 7.2, this has now been made possible in Collections, Communities and Notifications. Lots of bugs died, too. 29 bugs to be specific, and 10 accessibility issues addressed. 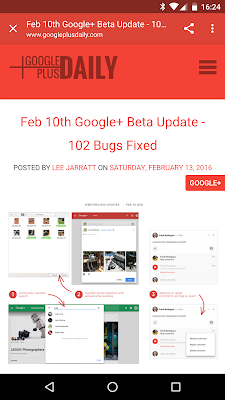 It’s good to know that the renewed focus on Google+ has allowed for faster updates and fine combing the little issues too.